Following a lackluster performance Wednesday night in a win over Garden City, the Seward County Lady Saints didn’t leave anything to chance Friday night in the Greenhouse as they put together their best offensive night of the year to wallop Lamar 3-0 in a swift 1:10 match. Seward came out swinging early and often in front of their home crowd Friday night. The Lady Saints got kills from four different players in the first seven points of the first set to jump out to a quick 7-0 lead. They pushed their lead to 10-1 before a Lamar timeout slowed their momentum, but the Lady Saints picked things up once again in the middle of the set, getting three kills in four points from Carolina Freitas to go back up 17-10. A block by Freitas and Alex Wood, the pairs second of the set, gave the Lady Saints an 18-10 lead and Seward cruised to the finish line, taking the first 25-13 to go on top 1-0 in the match. 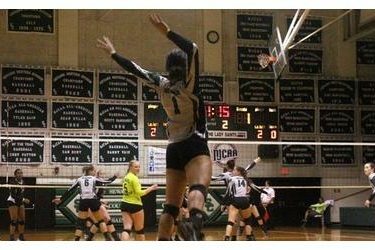 The Lady Saints came back out firing to begin the second in what was possibly their most impressive offensive streak of the 2014 season. Seward recorded 13 kills by seven different players to jump out to a 14-5 lead to start the period and extended their lead to 21-10 as they kept on swinging. A solo block by Lindsay Schwab and a kill by Megan Sharratt in the middle gave the Lady Saints set point and Carolina Gasparini put it away with a thunderous kill to give Seward a 25-17 win in the second. The Lady Saints finish the period with 20 kills, their most in a set all season, while hitting .333 as a team. With their lineup shuffled around, Seward struggled to find a rhythm early in the third as they trailed for the first time in the match at 5-4, but a 11-1 run midway through the set, led by three kills from Erika Gilbert put them back on top and gave them a comfortable 18-8 lead. Gilbert picked up another kill later in the set and the set would end the same way the second did, with another big kill by Gasparini to give the Lady Saints a 25-13 win to sweep the match. Seward finished the third with 12 kills and just 2 errors on 30 chances, good for their second straight .333 hitting percentage in the set. Seward hit .324 as a team in the match, averaging just under 15 kills per set, which marks their second best team hitting percentage of the season against an NJCAA Division I opponent after posting a .330 mark on Lamar on opening weekend. Gasparini and Sharratt had outstanding nights for the Lady Saints, finishing with a combined 17 kills without an error, good for a .515 hitting percentage together while Gilbert and Freitas each had 5 kills in the middle with just 1 combined error. Nacole Miller led the Lady Saints offense with 25 assists and also had 11 digs, good for her 7th double-double of the season. Kari Anderson paced Seward with 16 digs and Alex Wood had a team best 3 blocks for the Lady Saints. Seward improves to 20-12 on the season while Lamar drops to 7-22. Next up for the Lady Saints is a quick turnaround for a rare 11:00 AM Jayhawk West matchup Saturday morning in Dodge City as they take on a Lady Conq team who has lost 21 in a row.